The African Court on Human and Peoples’ Rights had not addressed any case involving the margin of appreciation doctrine. 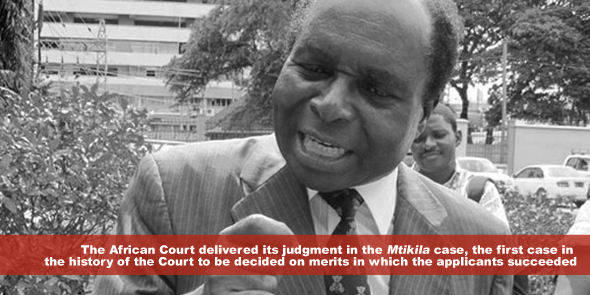 On 14 June 2013 the Court delivered its judgment in the Mtikila case, the first case in the history of the Court to be decided on merits in which the applicants succeeded. The case involves a challenge to a constitutional ban on independent candidacy in Tanzania at all levels of elections, namely, presidential, parliamentary and local council elections. The ban was constitutionalised through the eighth and eleventh amendments which reversed the decision of the High Court which found the ban to be a violation of the right to participation and the right to association of the Tanzanian Constitution. A subsequent decision of the High Court (Reverend Christopher Mtikila v Attorney General, Miscellaneous Civil Cause No 10 of 2005 (5 May 2006)), that the constitutional amendments themselves were unconstitutional, was reversed by the Court of Appeal (The Honorable Attorney General v Reverend Christopher Mtikila, Civil Appeal No 45 of 2009, Court of Appeal of Tanzania (17 June 2010)). The margin of appreciation doctrine is a prominent element of international human rights adjudication. It has been recognised by almost all major international and regional human rights tribunals, including the African Commission on Human and Peoples’ Rights. The principle essentially requires international and regional tribunals to defer to the policy choices of states in their attempt to give effect to protected rights. The principle has its roots in the subsidiary nature of international human rights law and adjudication reflected in, for instance, the requirement to exhaust local remedies before one may submit cases to supranational human rights tribunals. According to the African Commission, the principle recognises that respondent states are “better disposed in adopting national rules, policies and guidelines in promoting and protecting human and peoples’ rights as it indeed has direct and continuous knowledge of its society, its needs, resources, economic and political situation, legal practices, and the fine balance that needs to be struck between the competing and sometimes conflicting forces that shape its society” (Prince v South Africa 2004 AHRLR 105 (ACHPR 2004) paragraph 51). The case against Tanzania in the African Court is the same as the case against Mexico in the Inter-American Court, except in its scope. While the Inter-American Court had to decide on the ban on independent candidates in relation to presidential elections, the African Court had to decide on the ban of independent candidates in relation to all levels of elections, namely, presidential, parliamentary, and local elections. Other than this, the issues are similar. In addition, the African Court identified two contextual differences between the Mexican case and the case against Tanzania. First, unlike in Tanzania, individuals in Mexico may be sponsored by parties to stand for elections even if they are not members of that party. In addition, the African Court noted that the requirements for creating a political party were particularly cumbersome in Tanzania. However, the relevance of these contextual differences in influencing the final outcome was marginal. Despite the fact that there is no specific recognition of a right to stand for elections as an independent candidate in the African Charter or relevant human rights instruments, the African Court ruled that the ban on independent candidacy violated the individual right to equal protection of the law and the prohibition against discrimination (Articles 2 and 3), the right to association (Article 10), and the right to political participation (Article 13) of the African Charter. The Court held that Tanzania did not prove that there was a legitimate interest to be served by banning independent candidacy. In any case, the Court found that the absolute ban on independent candidacy was found to be disproportional to any stated aim of fostering national unity and solidarity. The Court also found that the ban had the effect of indirectly compelling aspiring politicians to join political parties to be eligible for public office in violation of Article 10(2). This later provision provided an important legal leverage that is not explicitly recognised in other human rights systems including the American Convention on Human Rights. The decision makes the African Court the first supranational tribunal to recognise the right of individuals to stand for elections as independent candidates. Although the outcome of the case has highly restricted the extent of margin of appreciation states enjoy in giving effect to the right to political participation, the Court did not sufficiently deal with the relevance of the doctrine in the context of allowing states to identify the best way to give effect to the right to stand for elections. The Court proved to be less deferential not only towards another regional tribunal, the Inter-American Court, but also a domestic court, the Tanzanian Court of Appeal. Whether or not the Court will sustain this very narrow conception of the margin of appreciation doctrine will be seen. Nevertheless, the decision of the Court clearly demonstrates its willingness to deviate from existing jurisprudence of other regional and international human rights tribunals. There is no question that the outcome of the decision of the African Court is profound in that it recognised the right to individuals to stand for elections as independent candidates. However, the Court did not sufficiently address some relevant issues. Firstly, the Court did not assess the implications of the ban on independent candidacy in relation to the different levels of elections, namely, presidential, parliamentary and local elections. For instance, the ban on independent candidates may be more justifiable in relation to presidential elections than local elections. Secondly, the Court did not look at the implications of its decisions to the electoral systems of states. For instance, countries with the proportional representation electoral system, where political parties take seats depending on the number of votes they received, would find it more difficult or demanding to allow independent candidates than countries with single constituency first-past-the-post electoral systems. These and other issues would have to be ironed out in future cases. It should also be noted that Tanzania is not the only African country that bans independent candidates. The decision of the Court therefore has significant implications to many countries. The decision may spark a wave of cases against other African countries with a similarly ban. In South Africa, for instance, independent candidates are allowed in relation to local elections but not in relation to provincial and parliamentary elections. Given the fact that the African Court took note of the particular difficulty of forming a political party in Tanzania, it is possible that the Court may uphold the ban in relation to other countries depending on the requirements to establish a political party. It is important to note that, despite the potential impact of the application on states other than Tanzania, no other state applied to intervene as an interested party. Such an intervention is allowed under Article 5(2) of the Protocol establishing the Court. It is likely that other states were not even aware of the case before the Court. Once the Court establishes itself as a notable element of the African human rights system, states will start paying attention to its activities. Adem Kassie Abebe is a post-doctoral fellow at the University of Pretoria (South Africa). He has a Masters in Human Rights and Democratisation in Africa from the University of Pretoria and a Bachelor of Laws (LLB) from the University of Jimma (Ethiopia). He has published articles on human rights and constitutional law issues. His main research interests include comparative constitutional law, human rights law and international law. I must commend the writer for a thought-provoking article. The above decision though sound at first glance but may be difficult to be applied in several states in Africa, more so, that some countries supreme courts (e.g Nigeria), have held that, where there is conflict between any Treaty and the Constitution, the Constitution shall prevail, see the case of ABACHA V. FAWEHINMI. I strongly believe that MTIKILA’s principle may not be followed by the African Court where though similar facts but peculiar circumstances exist. Nevertheless, i support the decision because, i believe that independent candidacy should be encouraged and not discouraged in Africa. It will be an uphill task,globally, for an independent candidate to win any election. It’s not about financial war chest,but it’s all about clout. It’s a sine qua non to be sponsored by a political party. It’s understandable why the Bills of Rights,etc,do not give overt support for independent candidacy.